What a night for Real Madrid! The Merengues visited the Camp Nou and wiped out Barça's tiki-taka, with a 1-3 win (2-4 on aggregate) that sends them through to the Copa del Rey final. The man of the match was naturally Real Madrid's forward Cristiano Ronaldo, who stunned the Camp Nou with another dazzling performance and scoring two decisive goals. Out of this World! 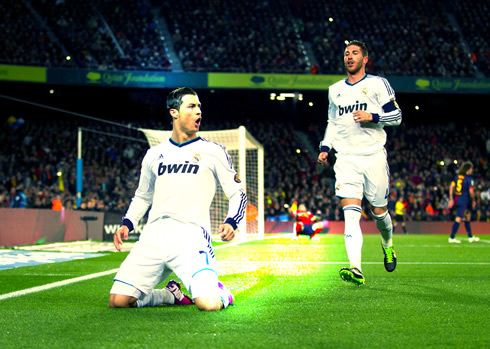 Cristiano Ronaldo led Real Madrid to victory at the Camp Nou, as he scored a brace in a very tasty 1-3 win for the Merengues. The Portuguese star also broke another record, as he became the first Real Madrid player to have ever scored in 6 visits in a row to the Camp Nou. Raphaël Varane got the third goal from a brilliant header and Barcelona's tiki-taka proved to be powerless against José Mourinho's strategy and gameplan, despite a late goal from Jordi Alba. The Merengues booked their presence in the Copa del Rey final after getting past Barcelona with a 2-4 result on aggregate and will now have to wait for tomorrow night, in order to know if their opponent ends up being Atletico Madrid or Sevilla. Next Saturday, there's another "Clasico" Real Madrid vs Barcelona this time for La Liga, and the following Tuesday, one of the most promising games of the season: Manchester United vs Real Madrid at Old Trafford. Unsurprisingly, Barcelona had most of the ball possession in this "Clasico", with 63% against 37% from the Merengues. Everyone was naturally already counting with that, including Real Madrid's coach José Mourinho, who once again brilliantly prepared his team to choke Barcelona's trademark dominating style. The Blaugrana surprised by leaving Alexis Sanchez in the stands for this game, while José Mourinho preferred to go with a partnership between Sergio Ramos and Raphaël Varane, leaving Pepe on the bench. The Frenchman ended up being on the best players on the pitch, as he proved to be decisive in sustaining Barça's attacking storms, one after another. Barça had the initial advantage, as the 1-1 draw pulled off at the Santiago Bernabéu meant that a goalless tie would send them through. 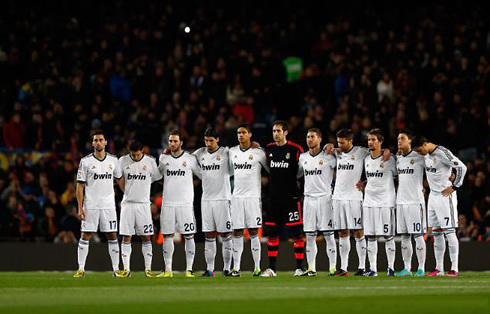 Maybe with that in mind, the Merengues didn't wait too long for making their presence noted in the Camp Nou. With roughly 12 minutes played, a counter-attack initiated in Di María, Ozil and Higuaín, allowed for Cristiano Ronaldo to go 1-on-1 with Gerard Piqué, in a chance that the 28-years old seized to take off and leave his opponent behind. However, the Spanish defender didn't appreciate much seeing his former teammate escaping and decided to trip Ronaldo, with a tackle already inside the penalty area which made the referee to don't even hesitate in pointing to the spot. The former Manchester United player assumed the responsibility and put the Merengues on the lead of the game and on the lead of this semi-final series. Real Madrid went to half-time with a one goal cushion lead, but with the perfect awareness that a second goal could very well grant them a decisive advantage in the series, as it would force Barça to score 3 goals to turn the game into their favour. In the 57th minute, a long clearance from Sami Khedira just a few meters ahead of his own penalty area, found Angel Di María with plenty of space to run behind Barça's defensive line. The Argentinian led the counter-attack until he entered Barcelona's penalty area and just before engaging into a promising 1-on-1 with Carles Puyol. Di María's waist movement sent Puyol to the ground and granted him with enough space to strike the ball into Pinto's direction. The controversial Spanish goalkeeper blocked the shot, but saw the rebound falling into Cristiano Ronaldo's action area. At that moment, it was like the Camp Nou knew what was coming, as Ronaldo controlled the ball on his chest and with his left foot, he struck it into the back of the net, giving Real Madrid the two goals lead. What a glorious night for the Portuguese striker it had been so far! The cherry on the top of the cake would arrive near the 68th minute, in a rare Real Madrid goal coming from a corner-kick. Mesut Ozil took the set-piece on the attacking right side, curled the ball into a perfect spot and saw Rapahël Varane rising in the air to meet his cross. The French defender's perfect header gave no chance whatsoever for Pinto to even attempt to save it, and the ball went in right in the corner, still scratcing the crossbar before hitting the net. The scoreboard marked a 0-3 for Real Madrid at the Camp Nou and close to 100.000 Barcelona fans were simply incredulous with what they were seeing on the pitch. The Blaugrana tried to react over and over, but they kept bumping into a well organized and prepared team, and there was no tiki-taka that night capable of breaking down the Merengues defence. The only exception took place already deep in the second half, with the clocks already marking 89 minutes. Andrés Iniesta found Jordi Alba with a lob pass that went above the whole Real Madrid's defence, and the Spanish left-back didn't mess it up and beat Diego López for the first time on the night. Curiously, the same Jordi Alba already have had a very similar chance on the first leg at the Santiago Bernabéu, but didn't keep his composure back then and ended up wasting a great goalscoring opportunity. The final whistle came on a few minutes later and Real Madrid confirmed a truly deserved victory, at their arch-rivals' own home grown. The Copa del Rey final will now feature Real Madrid against either Atletico Madrid or Sevilla, and Mourinho made sure he'll have at least one final to still fight for at the end of this season. As for the upcoming days, things won't get more quiet for sure, with a Real Madrid vs Barcelona clash for the Spanish League scheduled for this Saturday and of course, the unmissable Manchester United vs Real Madrid next Tuesday, March 5. Cristiano Ronaldo prepares to return to Old Trafford and he couldn't have asked for a better motivation game than the one he had this last night! Cristiano Ronaldo next game for Real Madrid will be again against Barcelona, on March 2, 2013, this time at the Santiago Bernabéu and for the Spanish League. You can watch Juventus live stream, Real Madrid vs Barcelona, Sevilla vs Atletico Madrid, Middlesbrough vs Chelsea and Bayern Munich vs Borussia Dortmund, all matches provided from our soccer live section.